North Korea has developed a new long-range mobile intercontinental ballistic missile that the Pentagon says moves the country’s leader Kim Jong Un closer to the goal of building missiles capable of striking the U.S. mainland with nuclear warheads. The new missile is called the KN-14 by the Pentagon and is a longer-range variant of the KN-08 road-mobile ICBM first made public in 2012. Both the KN-08 and the new KN-14 have not been flight tested. But defense officials familiar with reports on the weapons said both systems have been tested in all other aspects of their development. "It’s a KN-08 on steroids," said one official of the new KN-14. No details about the KN-14’s capabilities, such as its range, warhead carrying capacity, or the number of missiles were disclosed by the officials, who said reports of the missile were circulated by U.S. intelligence agencies within the past two weeks. The new KN-14 missile was first displayed during an Oct. 10, 2015 military parade in Pyongyang. Its main external difference from the KN-08 is a shorter length and blunt nose cone. Rick Fisher, a senior fellow at the International Assessment and Strategy Center who has studied the two missiles’ Chinese launchers, said Russia has estimated the KN-14 could have a range between 5,000 and 6,200 miles. "From the far northern corner of North Korea, [6,300-mile] range is sufficient for the KN-14 potentially to reach Chicago and Toronto," Fisher said. "It may be a stretch to fulfill North Korea's recent propaganda video called ‘Last Chance’ depicting a nuclear strike on Washington, D.C."
Fisher, however, said the rapid development of the KN-14 from the KN-08 indicated Pyongyang could be capable of building even larger missile variants that would have sufficient range to strike Washington. North Korean missile analyst Scott LaFoy, writing in NKNews.com, said the KN-08 shown in October appears similar to the Russian SS-N-18 submarine-launched ballistic missile. "It is apparent that North Korea is continually researching and upgrading its ballistic missile designs," he said, adding that the differences are so significant that the new missile should be given a different designator from the KN-08. Based on photo analysis, the KN-08 appears to have been modified from a three-stage missile to a two-stage missile with a warhead or a three-stage missile with more compact stages. "Comparison of the old and new KN-08 bodies indicates that either the third stage has been eliminated entirely to house the original [reentry vehicle] or that, by using a certain type of post-boost vehicle, the third stage has been reduced in visible length," he said. Data cables on the missile changed from two on the sides of the KN-08 to one on what is now known as the KN-14. Disclosure of the new long-range North Korean missile comes amid growing tensions on the Korean peninsula, where Kim has issued repeated threats to use nuclear weapons against the United States and South Korea. North Korea on March 25 posted a YouTube video titled "Last Chance" that simulated a nuclear missile attack on Washington. The video ended with a threat to "unhesitatingly strike … with nuclear [weapons] … US imperialists … if they move even a little bit." North Korea also posted a video of simulated attacks on South Korea’s presidential residence. U.S. officials said the videos are the latest in a series of menacing anti-U.S. propaganda from Pyongyang. State-run North Korean media last week also showed Kim, the North Korean dictator, at a missile test facility where a solid-fuel rocket motor was tested. Mobile missiles use solid missile fuel that allows for rapid set up and firing, compared to liquid-fueled missiles. The week before that test, North Korea boasted of testing a warhead reentry shield that would allow warheads to reenter the atmosphere without burning up. North Korea is believed to have between 10 and 20 nuclear warheads, but its long-range missile capabilities remain uncertain. In addition to the KN-08 and now KN-14, North Korea has Taepodong-2 missiles that double as space launchers for satellites. 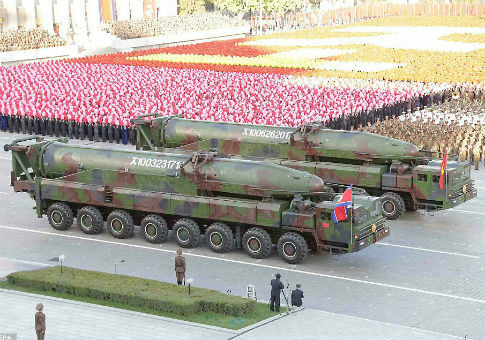 The Pentagon’s most recent annual report to Congress on the North Korean military said the KN-08 was first displayed on six mobile launchers during military parades in 2012 and 2013. "In October 2015, North Korea paraded four missiles on KN-08 [transporter erector launchers]," the report said, adding that they were "noticeably different from those previously displayed on these TELs." The KN-08, if successfully designed and developed, "likely would be capable of reaching much of the continental United States, assuming the missiles displayed are generally representative of missiles that will be fielded," the report said, adding that ICBMs are extremely complex and require multiple flight tests to correct design and manufacturing defects. "Without flight tests, the KN-08’s current reliability as a weapon system would be low," the report said. However, days after the KN-14 was shown in the Oct. 10 military parade in Pyongyang, the commander of the U.S. Northern Command, Adm. William Gortney, told Congress he believes North Korea currently is capable of hitting the United States with a nuclear missile. "I agree with the intel community that we assess that they have the ability, they have the weapons, and they have the ability to miniaturize those weapons, and they have the ability to put them on a rocket that can range the homelands," said Gortney, who is in charge of missile defense of the continental United States. The Obama administration has not taken action against China for its significant contribution to the KN-08 and KN-14, namely the Chinese-made transporter erector launchers that carry the missile and appear to have been exported in violation of United Nations sanctions. 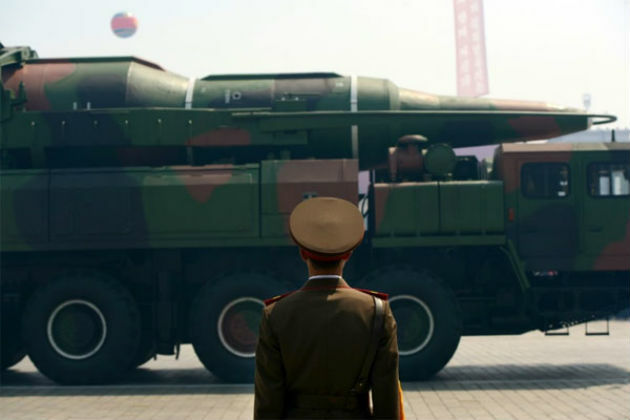 China continues to proliferate missile and nuclear technology around the world, including the launcher exports to North Korea, which official U.S. estimates say include six road-mobile missiles. A U.N. panel of experts on North Korea stated several years ago that China claimed that the launchers were sold to North Korea as timber haulers. That claim has been dismissed by arms proliferation experts who say the truck launchers are too wide to travel on most logging roads. Confirmation of the new long-range ICBM comes as world leaders arrive in Washington this week for a nuclear security summit focusing mainly on the threat of nuclear terrorism. Chinese leader Xi Jinping is scheduled to attend the summit and will meet with President Obama on Thursday. Fisher, the China military affairs expert, said the administration recently praised China for its nuclear security cooperation. Fisher said this praise was misplaced. In addition to providing North Korea with road-mobile nuclear missile launchers, similar Chinese-made, 16-wheel missile launchers were recently shown in news reports carrying Pakistan’s Shaheen III medium-range ballistic missiles. "China clearly has no intention of stopping its technology transfers that for decades have enabled North Korea's and Pakistan's nuclear missile capabilities," Fisher said. American efforts to gain Chinese support for curbing the smuggling of nuclear material are useful, he said, but the administration has so far taken no action against the missile launcher’s producer, the China Aerospace Science and Industry Corp. (CASIC). "It is a profound contradiction for the administration to fail to sanction CASIC and to fail to publicly criticize Chinese leaders for allowing CASIC to enable Pakistan's [medium-range ballistic missiles] to target all of India and to allow North Korean ICBMs to target American cities," Fisher said. This entry was posted in National Security and tagged North Korea, Nuclear Weapons. Bookmark the permalink.